As a lifelong taillight obsessive, I’m sort of appalled at myself that I wasn’t aware that these bits of taillight arcana had an actual name. The things I’m referring to are those reflective panels, made of the same plastics and colors as a car’s taillights, that fill in the rear body section between the separate lights to give the illusion of one long, contiguous taillamp unit. Often the car’s brand or name will be on the panel. These things have an actual name. An actual German name. Anyway, a heckblende is a pretty specific thing. A car with a full-length taillight, like a modern Dodge Charger, where the entire width of the light unit is illuminated and it was designed from the start to be a full-width tailliamp system, is not a heckblende. A heckblende appears to be only applicable to plastic reflective panels designed to fill in the area between two taillamps that were originally designed as separate units. Most heckblende designs attempt to replicate the color sections of the original lights, and as such may include, in addition to the expected red, amber and, very occasionally, white sections. I suppose a heckblende could be illuminated? I feel like I’ve encountered some that do light up with the taillights, so, I guess that can be part of it. Heckblendes had their heyday in the 1980s, and while they seemed to be most popular on German cars, it was a global phenomenon. American cars employed their share of heckblendes, with Ford being an especially enthusiastic user, though Chrysler employed plenty as well, on cars like the LeBaron. Japan had some heckblende fever as well, with Honda, Toyota, Mitsubishi, and even sweet little Daihatsu all heckblendeing the crap out of anything they could. Does that count? Maybe not, because there’s no attempt to make the taillights contiguous. It’s just kind of weird. Heckblendes seem to be fading away in automotive design; now, if a designer wants a full-width taillight look, they’re usually able to accomplish something much more organic and intentional, and modern car designs don’t really have areas between the lights that can so easily be filled, even somewhat convincingly, with a heckblende-type panel. 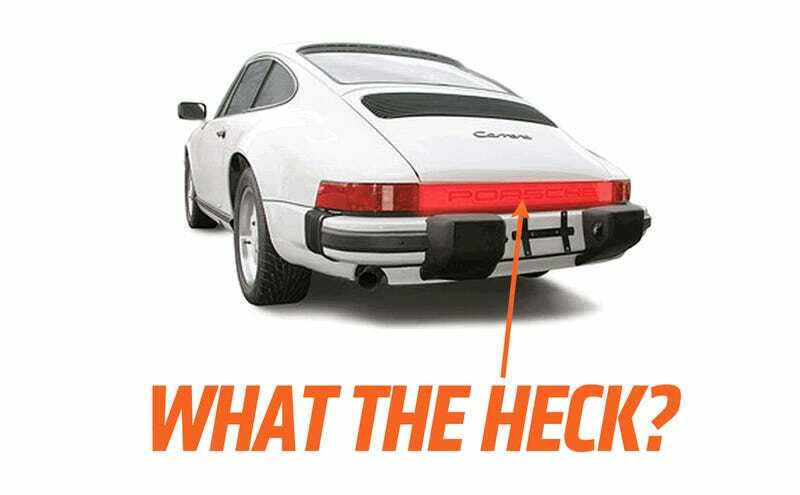 Anyway, perhaps now you know one more bit of absolutely useless trivia related to taillights! Your day is complete! Feel free to knock off early.